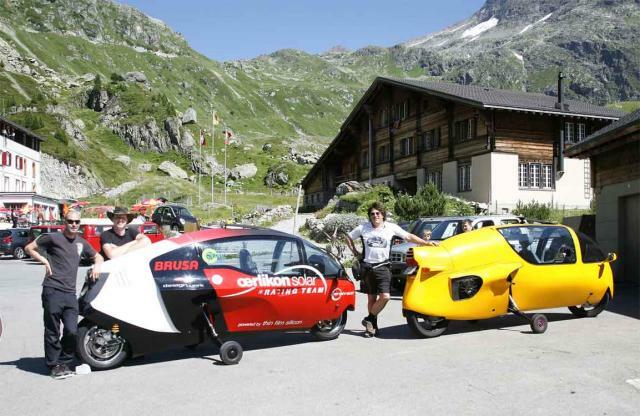 On the way back from Brno, in July 2010, I took the 1991 Ecomobile to the top of the Sustenpass to meet Team ZeroTracer, who were there for a photoshoot shortly before they set off around the world in the all-electric ZeroRace. Tobi Wülser, who also designed the Monotracer shape, is far left; Frank Loacker is next to him in the hat. I could only stop there for 15 minutes before jumping back into the Eco and dashing down the mountain to Zurich to catch my plane back to London, leaving the Eco in the free airport motorcycle park, as arranged! PNB.